What is something people might be surprised to learn about me? Not to brag, but I'm kind of a genius with a pair of knitting needles. I learned how to knit when I was young (grade school), and have made numerous sweaters, scarves, wrist-warmers....you name it. I kind of have a 3-dimensional brain; I can see a neat sweater, or a funky scarf, etc. in a store or in a magazine and can "plaguerize" it without a pattern. 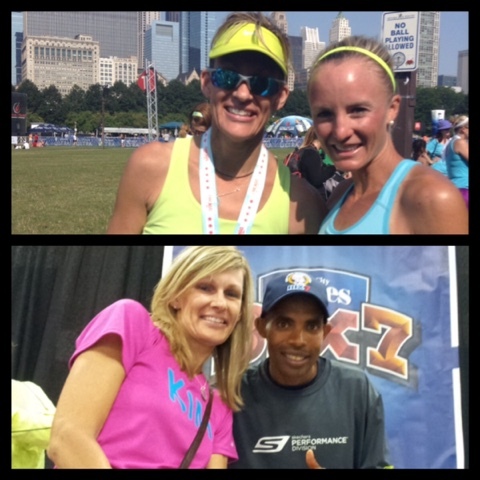 Yes, David Letterman (when I was in 8th grade), but last year I met Meb Keflezighi (at the Quad Cities Times Bix7) and Shalane Flanagan (at the Rock'N Roll-Chicago). 80's/90's style hair! 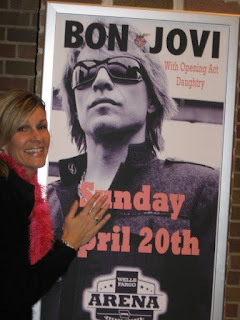 Yes, I was also guilty of the fried and dyed 'do with dorky bangs....WHAT was I thinking??? What is the thing on your travel/must see/bucket list? 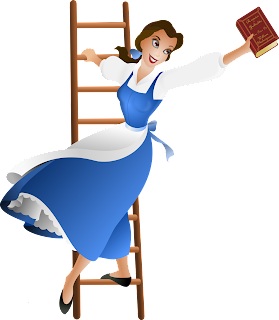 Belle.....because she saw beauty in everyone (and she loved to read). The Broadway version of Mamma Mia was AWESOME!!! 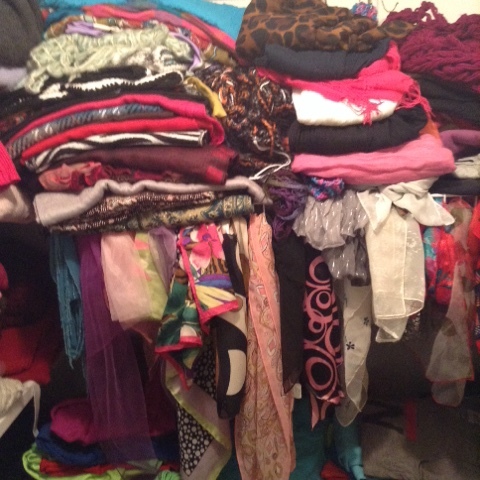 What clothing item/accessory do you have too much of in your closet? Scarves, scarves, and scarves! I wear scarves year-round...warm & fuzzy ones in the winter and fall, and light & airy ones in the spring and summer. 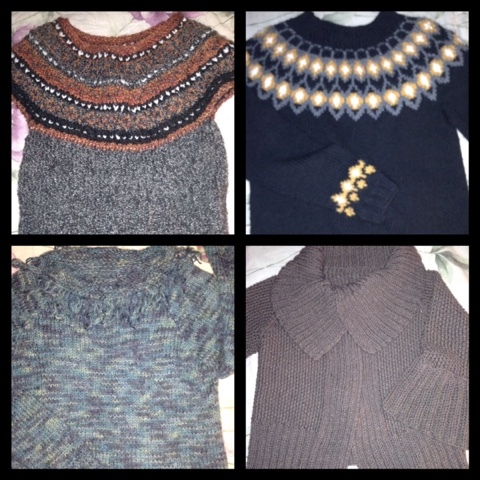 Solids, stripes, florals, patterns and, my newest craze, cowls. I love 'em all! Bad grammar! Seriously. 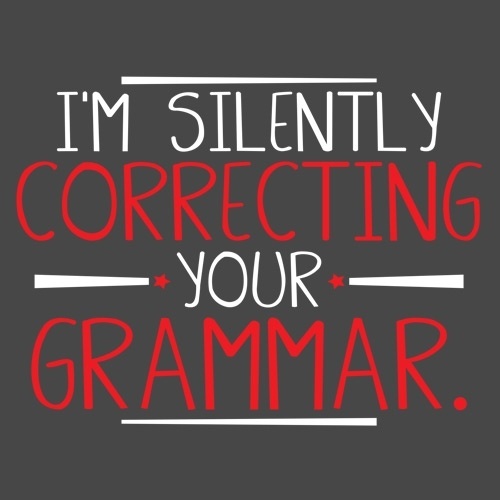 Is there a "grammar bleep" app (like spell check) available for social media? 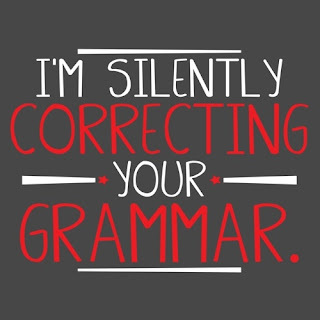 If so, I wish more people would use it to zap the grammatically incorrect things they try to say. ***I'm tagging Karen (at Trading in My Heels), Teri (at Reinventitude), and Fran (at I Run Long). How about you? Got any answers to share? Sometimes, it's not all about me. Shocker, huh! Do you have a race that you have done a few times, but just keep going back and doing it again (and again)? 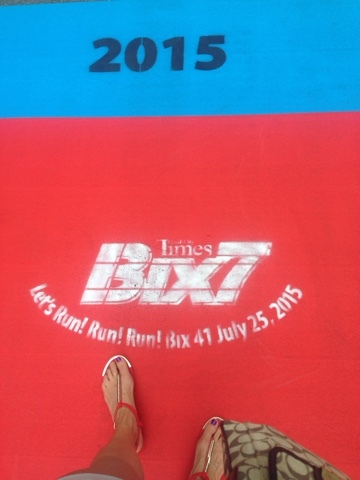 Case in point-The Quad Cities Times Bix7. Except this year, I didn't lace up and pin on the race bib. Granted, the thought crossed my mind (several times, actually). I have run this race three times, most recently last year (here's the blog post LINK), and it's a grand event. Imagine, if you will, a race course that not only involves constant hills...but starts out with the biggest grand daddy of them all at the start line (we're talking most of the entire first mile feels like you're going straight up). The distance is unique....seven miles, kind of a long distance to sprint, but not so far that you need a super conservative pace to sustain yourself. Did I mention this happens in July? In Iowa? And the weather (almost) always ensures very hot and humid race day conditions. And this event draws upwards of 10,000 racers, enticing the top finishers (male and female) with a $12,500 cash prize. Having just come off my first-ever ultra race, I'm in the throngs of recovery. 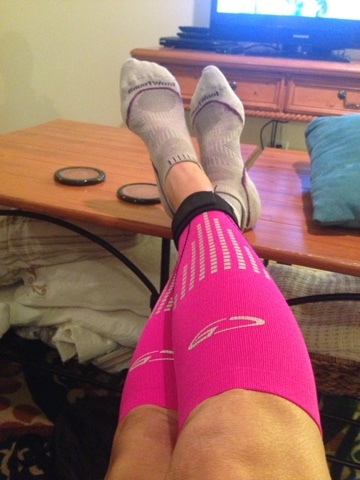 The first couple days post-race had some major stiffness and typical aches and pains. All of that has ended, though, and I probably could have registered onsite and toed the start line of the Bix7....but I elected not to. This race is always tough, even under ideal conditions, so I know it would have been even more challenging considering what I just put my body through a week prior. 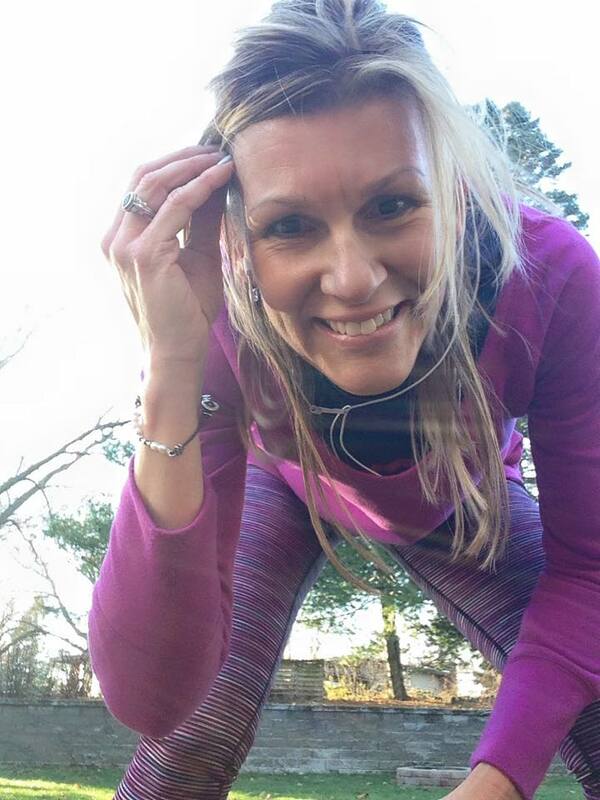 I'm experienced enough in running (and recovery) to know one's body is never as "fully recovered" as it may appear to others (or feel to oneself), and I have learned to respect the recovery process. Although the residual aches and pains are minimal this go-round, I am choosing to let them heal completely before I dive back into another training cycle. 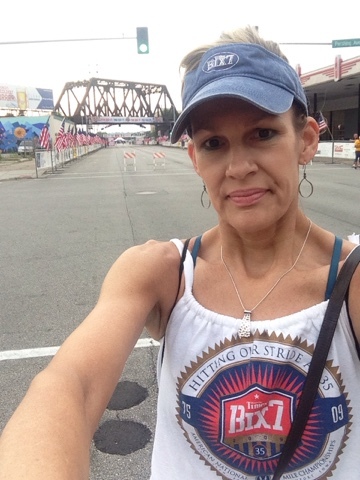 My friend, Barb, had registered spur-of-the-moment for the Bix7, but didn't decide until a couple days prior whether or not to actually run it. I decided to go along and cheer her on (and also several other friends). 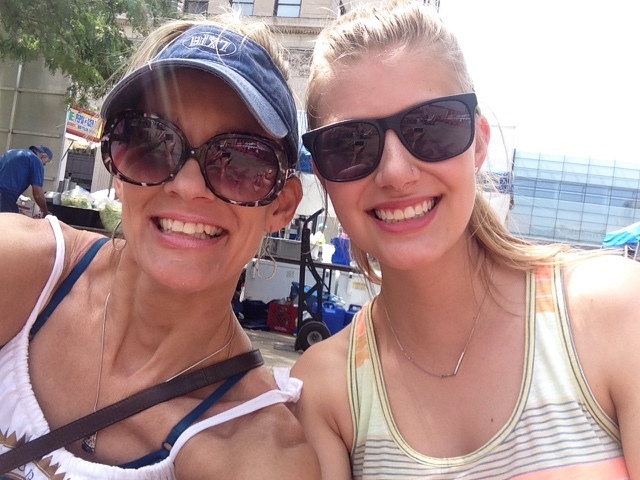 I've never actually watched the Bix7, so I was eager to be a spectator and take it all in from an "observer's perspective." So, there we were, downtown Davenport, Iowa on another hot and sticky July morning. The excitement in the air was almost as heavy as the humidity. There was no denying the constant, nagging envy I felt in seeing all the racers walking around with race bibs, but I knew I was doing the right thing in sitting this one out. Also on tap for the day was meeting up with our oldest daughter, who is currently doing an internship in the Quad Cities for the summer. She had a couple friends running as well, and her and I (and some of her friends) were going to hang out after the race was finished. Barb took off to get in her corral, and AJ (her daughter) and I began the climb up a nearby street to get to a viewing spot on the course. I purposely left my running shoes back at home so I wouldn't be tempted to register onsite at the expo (or even on race day morning), so I was high-tailing it (at a rather fast "speed walk" pace) in less-than-ideal shoes (cute, sparkly sandals). We heard the National Anthem, and saw the flyover airplanes, and then heard the starter gun. We made it to Kirkwood, and were positioned right near the 1-mile mark (which is also near the 6-mile mark, on the opposite side of the boulevard, for when the racers are making the return trip from the turn-around). It really was exciting seeing all the runners! The first mile of this race is probably the most challenging, due to the intensity of the hill, so several of the runners were already walking. We had to wait for quite awhile before there was a big enough gap to allow us to cross the street and stake a place on the boulevard dividing the two lanes of the road. 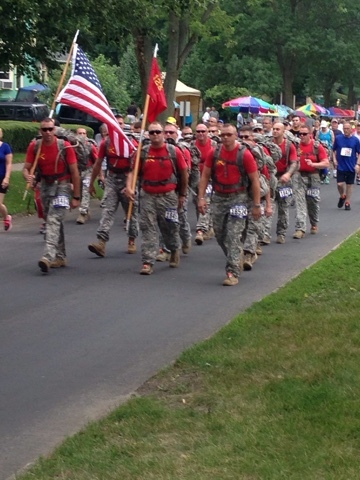 We saw a group of US Army guys, walking the course in full gear. Seeing military personnel at events like this always gives me a lump in my throat. It was around the 30-minute mark when we spotted the cluster of lead runners coming towards us. Since I had not planned on running the race this year, I had not paid much attention to any of the pre-race press. 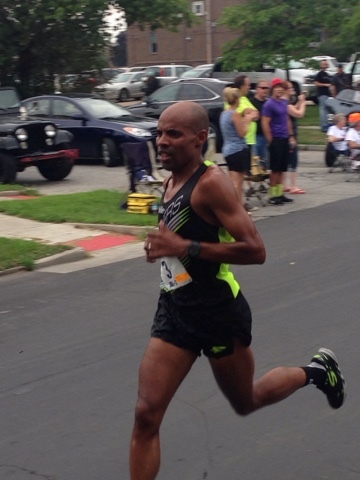 Last year, Meb Keflezighi (the 2014 Boston Marathon champion) was one of the featured elites at the race. Imagine my utmost surprise in seeing him at the expo again this year! I had not heard if he was actually racing or not, so I scanned the group of lead racers.....and didn't see him. A short while later, though, there he was! He makes this running thing look so easy! Go Meb! I was close enough to give Meb a high-5...but I didn't want to break his stride. He finished 8th overall, with a time of 34:01. YOWZA! We waited, and kept scanning the runners, looking for Barb. We were approached by a trio of Elvis impersonators, though. We told them we were looking for Barb.....and they took off walking into the crowd of approaching runners, shouting "Barb? Is there a Barb out there?" (Seriously, I'm not making that up!) A short while later, we spotted her coming towards us. Way to go, Barb! Only one mile left, and it's all downhill! Eager to get back to the finish line, we headed back towards downtown. Let's just say the downhill jaunt went much quicker than the uphill climb earlier. Barb had finished by the time we got to the finish area. It was roped off, to keep the non-runners out of the crowded after-party area. It didn't take us long to find her, though. We congratulated her on her finish, and chatted for a few minutes. She said the race had been tough with the high temps and extreme humidity. Her and AJ needed to clear out, so I headed over to the meeting spot where my daughter was stationed. Just after finding the daughter, I also found Tammie! She's a gal I have known through Facebook and recently met her in person at another race. 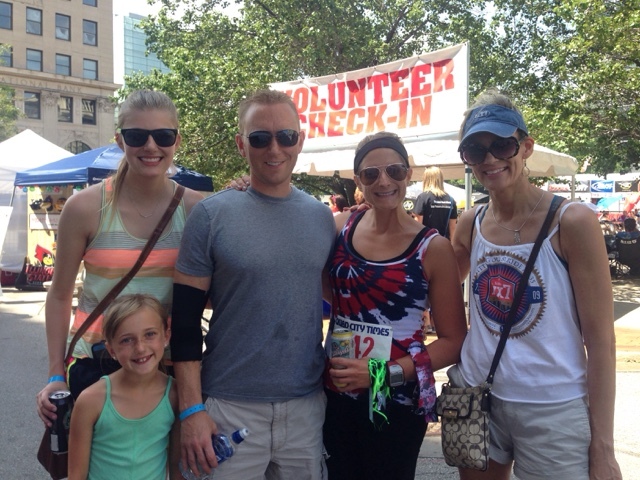 This was her first Bix7 and she also thought it was difficult in the heat, but thought the event was fun. Glad I gt to see Tammie again! Also happening that morning, a few blocks over from the Bix7 finish line, was Street Fest, and the street was lined with numerous vendors selling craft items and food. Wow! So many colors and patterns! 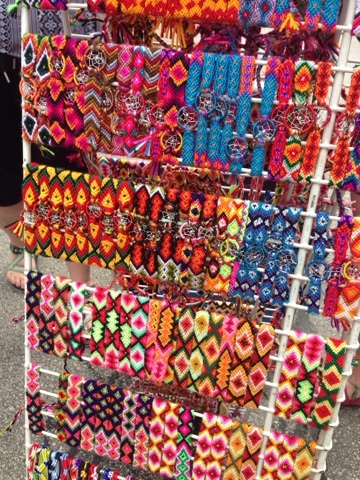 Our first stop was a booth that had numerous colorful braided bracelets. The art geek in me was in heaven! So many choices! 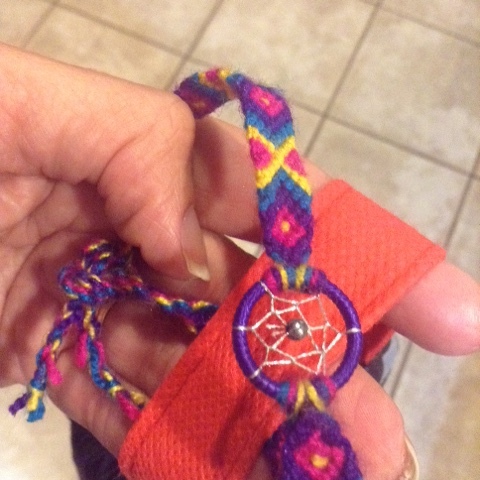 We snagged a few bracelets; a couple for the daughter, and one for myself. I probably won't actually wear it on my wrist, but plan to tie it onto my race belt, so I'll have it with me for some of my future races. What do you think? Pretty cool, huh! A great momento from the day! It was great seeing Jessica and family! 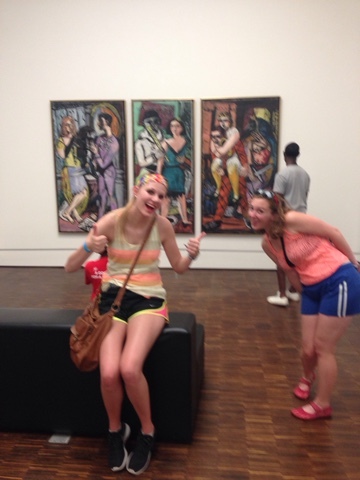 Later, we spent some time at the Figge Museum (also down near the all the activity). They had free admission, and several floors of art to peruse (in a beautiful, air-conditoned setting). The daughter, like her mother, also has an appreciation for all things art. 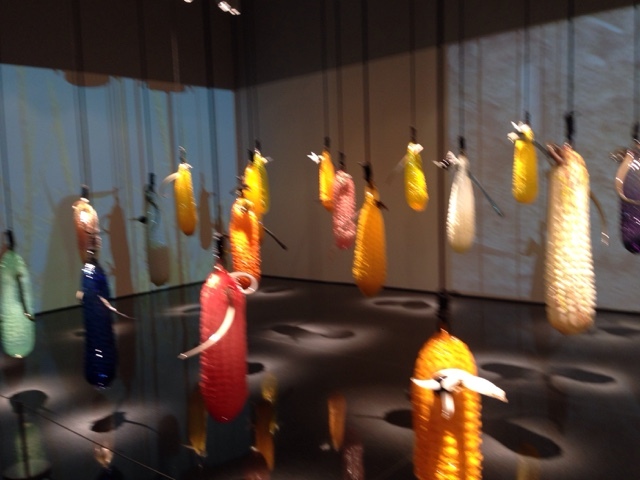 We were especially intrigued by the Corn exhibit.....several hanging glass ears of corn, in multiple colors. Hmmm, how's that for an Iowa-themed display! 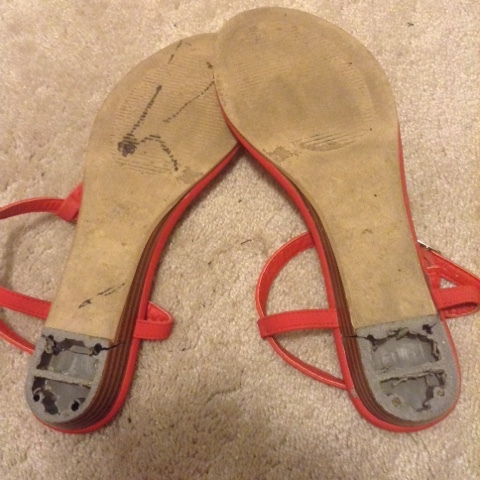 Not certain how many miles I walked in the fancy sandals, but apparently too many. I have never had both soles of a pair of sandals come off before...and this happened with my being totally unaware of it. No wonder my shoes were making so much noise in the quiet museum. All in all it was a great day. I got to watch a great race, with lots of speedy runners. I had a small brush with fame in seeing Meb (though I didn't get his autograph this year). 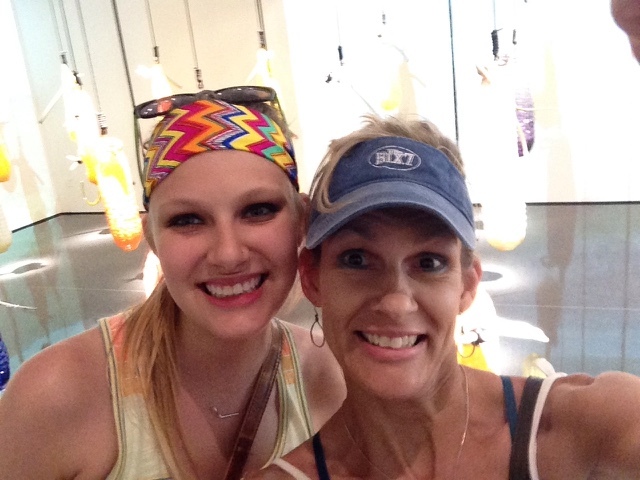 Time spent with the daughter is always great, especially since she's not living at home this summer. I got to cheer on a few friends as they ran, and I was able to meet up with the ones I missed. And, I'll never turn down a tour through a museum. 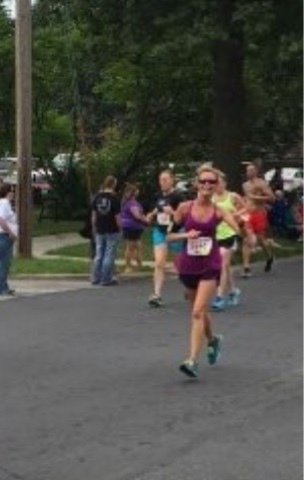 Although I was a little bummed to sit this one out, I do plan on running the Bix7 again, several more times in the future. 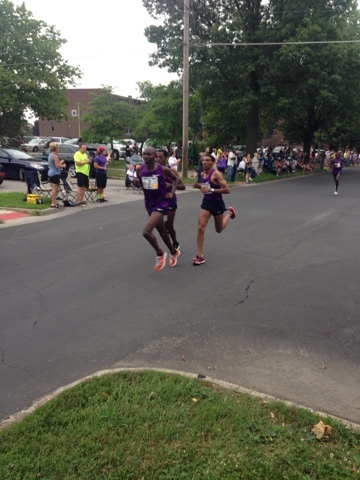 I went for a 4-mile run on Sunday in very similar weather-line conditions as the Bix7 racers endured the day prior. The run wasn't difficult, but I could tell my body still needs a little more time off from longer distances (my left foot is still a little wonky from the plantar fasciitis issues earlier in the summer). And that's all fine. I have nothing to prove to anyone, and nothing to gain from doing too much too soon. 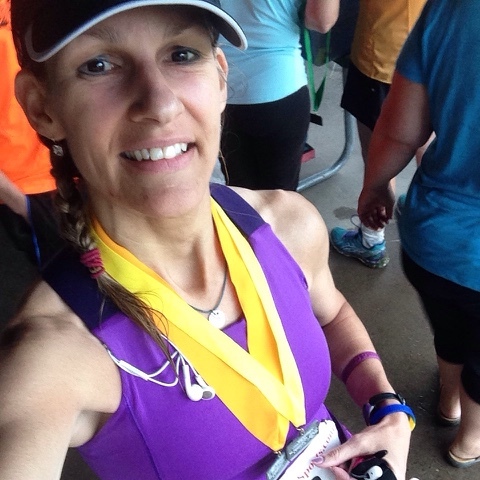 I have some half marathons coming up in the fall, and I'll be rested, recovered and raring to go! 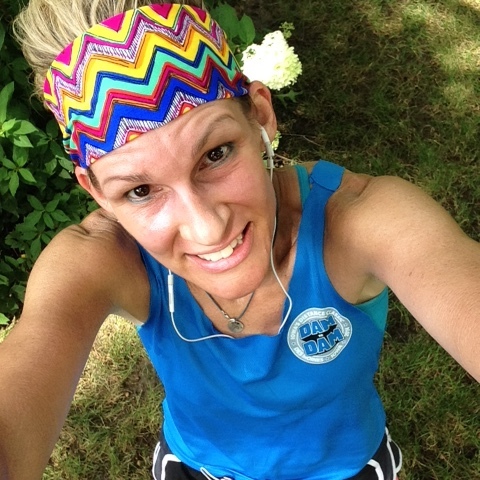 How do you feel about hot & humid runs? Got any big races on tap for the fall racing season? Wow. I never could have imagined how much fun could be had at such a tough event. 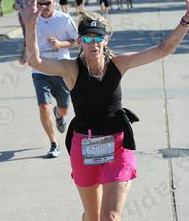 And, the strength that I had to draw upon (not just from others, but also from myself) was amazing.I have done a few marathons, but they have all happened in daylight. 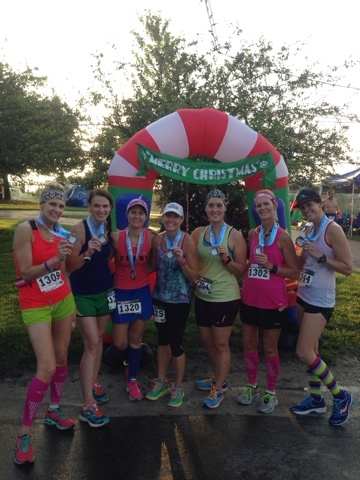 And I have done many races with friends, but never a race of this magnitude with so many wonderful gal pals by my side. It's hard to put into words all the struggles, feelings and emotions that went down during the 6+ hours of my first ultra, but I will try to best re-create the scenario. First of all, this event, Chistmas in July, took place, as you can probably guess, in July (and Friday, July 17th, was the current hottest day on record at this location). This weekend-long celebration included the usual 5K and 10K, but also 6-hour, 12-hour, and 24-hour timed events as well. 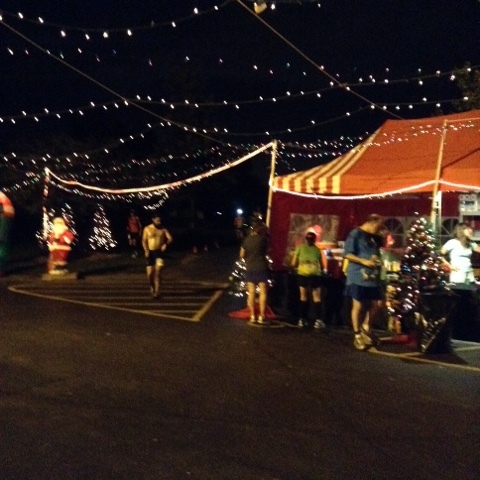 My event, the 6-hour endurance race, started at midnight (when most of us, myself included, are usually sleeping). And, I had set my goal on running a 50K (31 miles, my longest distance ever) within the 6-hour time limit. If you do the math, that's already three strikes against me before we even pulled into the parking lot. Thankfully, I was not alone in this endeavor. 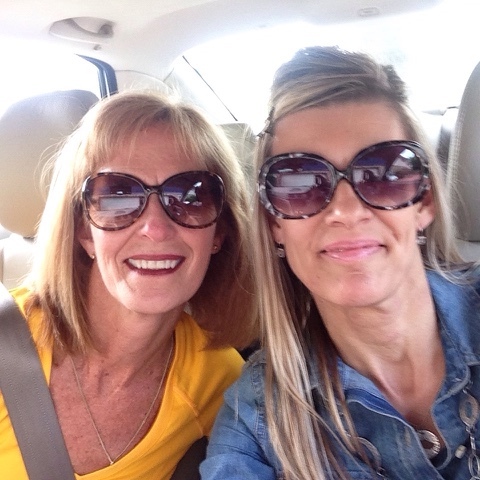 My dear friend, Barb, came along for the adventure. We were staying with Penny, another dear friend whom I have known for awhile and have run/raced with before (Rock -N Roll Chicago last summer). We also were meeting up with Karen, another friend I recently met face-to-face at Drake Relays half marathon (but have known via social media for a couple years). New to my "mix" of friends were Maggie, Michelle, and Teri...all gals I have known through Facebook, but had never been up close and personal with...yet. We arrived at Penny's house on Thursday evening, in hopes of getting at least one good night of sleep. We spent most of Friday inside, trying to avoid the heat (temps in the mid-90's with high humidity). 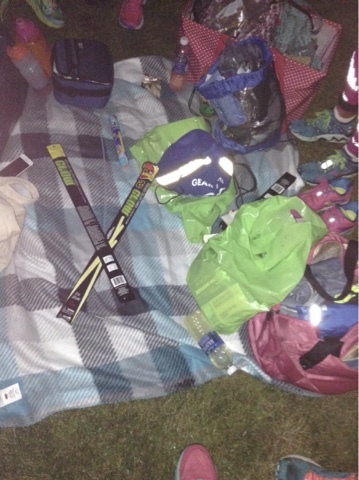 Having never run a 6-hour race at midnight, we were unsure about what we should do regarding food and carb-loading...eat at the regular dinner time? Have "usual" breakfast food, as if it were a morning race? Or a carb-heavy meal of pasta? What about taking a nap after dinner? Would that give us a little bit of rest, or make us more tired? As if the food/fueling wasn't enough to worry about, the sudden warm front that had come in Thursday had brought with it a threat of rain and thunder storms. WHAT???? I had brought along a light, "rain proof" jacket (just in case), but had forgone the mandatory hat for rain cover. All of the Doppler reports we checked that evening, though, showed the storm cells passing through, and it appeared all of the major rain would be gone by race time (#fingerscrossed). 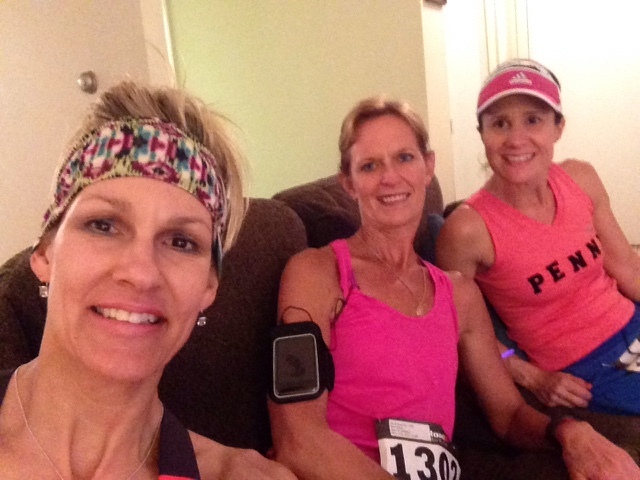 Michelle met us at Penny's house at 10:00PM, and we headed to the race, arriving there around 10:30. As soon we pulled into the parking lot, we spotted Karen's car (Teri was with her), so we were able to park right alongside them. Although we had driven in a little bit of light rain, it had stopped by the time we got to the race. The air was still humid, but felt a little bit cooler. But there were occasional lightning displays....off in the distance. A short while later, Maggie arrived and our UBAGE (Ultra BadAss Girls Extravaganza) team was complete. First, we set up "camp"
I left a graffiti message on Santa (someone had to give him a Herky tattoo, and proclaim "Go Hawks!"). 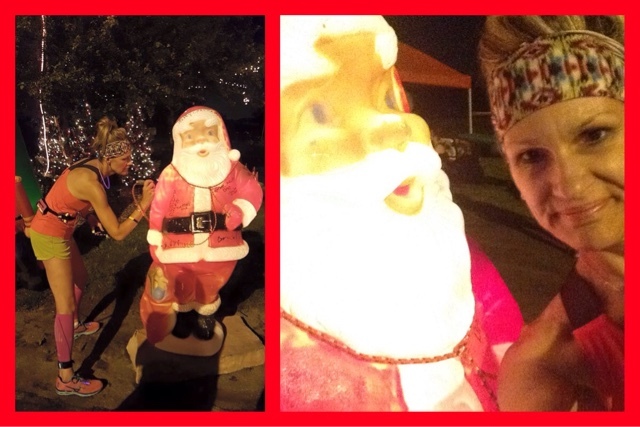 Well, hey there, Santa.....What's that? You're a Hawkeye fan, too? They called for all of the 6-hour runners to line up, and a few minutes later, we were off and running. 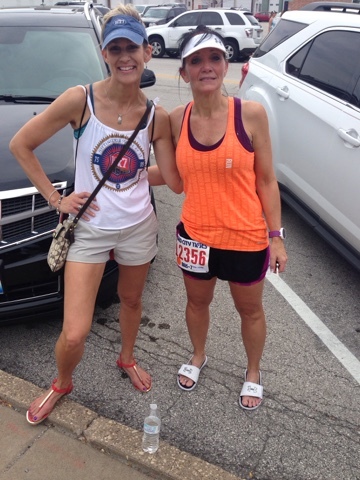 All of us are seasoned marathoners, but for the Iowa gals (Barb and myself), this was our first time running an ultra. 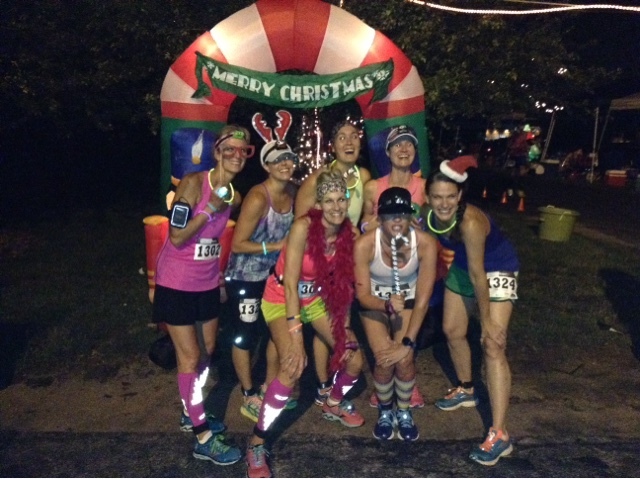 For all of us, though, (except for Karen, who had run this event last year), this was our first-ever over-night race. A unique feature about this event is the course. 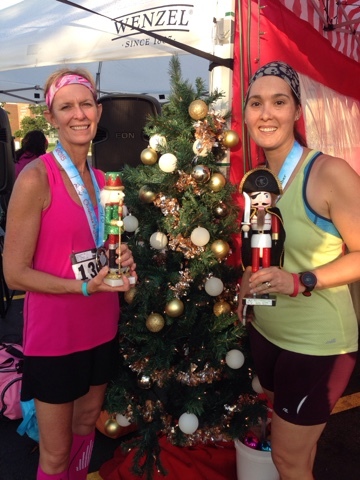 Instead of running through city streets, open trails, or looping around town, this course was a 1-mile route (technically, it was .973) that we had to run repeatedly, as many times as we were able, within our 6-hour time limit. 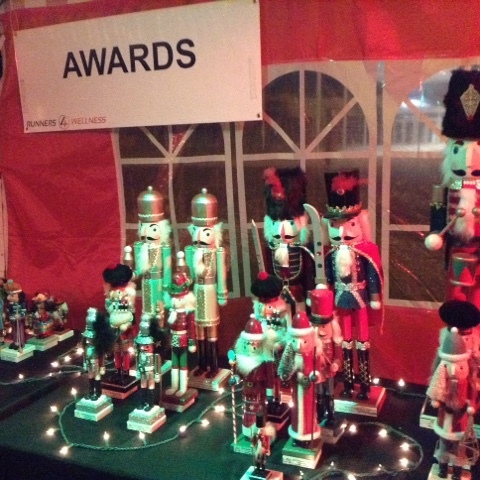 There were luminaries all along the route to light our way, several blow-up displays and occasional lighted Christmas trees. The route started out along a street (on the sidewalk), then turned onto an asphalt trail that twisted and turned around a lake (involving a bridge). There was a long, curved path up a hill (that somehow seemed to get progressively steeper as the night wore on), followed by a sharp 45-degree left turn (also getting progressively more acute each time we approached it) that took us back along more curves towards our "campsite," then along the numerous aid stations and, finally, back to the start line. Evey time we crossed the start line, our ankle timing chips chirped and our laps were recorded...and we could began the entire route again for each subsequent lap. All seven of us started as a group. Penny had master-minded a pacing plan that would get her to 33 miles. Most of us did not wish to go quite that far, but her plan was solid. Her starting pace (10:40), was very conservative, so I thought it would be easy to hang with her and Maggie for awhile to prevent myself from going too fast too soon. After the first 1/4 lap, I could already tell my shorts were starting to shimmy upwards. Typically, I don't have problems with chafing, but having never run for six continuous hours, I did not want to take any chances. As we approached our campsite near the end of our second lap, I decided to pull off for a few seconds and reapply some BodyGlide on my upper thighs as a precaution. Back on the course, I grabbed a water at the aid station just before crossing the timing mat (to start my third lap). It didn't take long to catch back up with the gang. I didn't see Barb, but Penny and Maggie were a short ways up ahead, and the cluster of Karen, Michelle and Teri were just ahead of me. 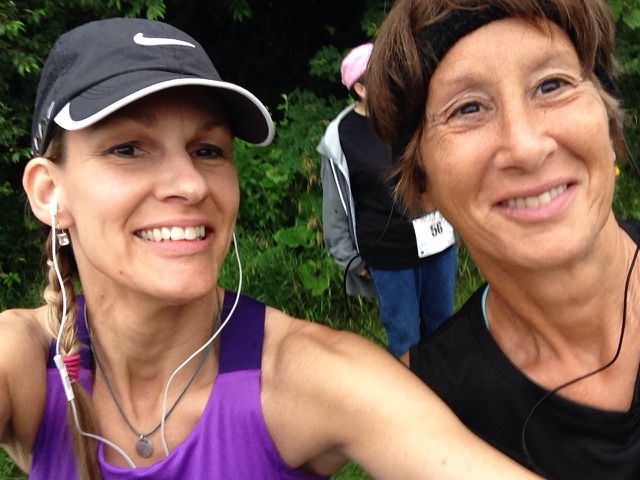 I fell into pace alongside Teri, and her and I stuck together for the next 5-6 miles. I think it was somewhere during our fourth lap when the rain started to fall. It had been lightning all along, but off in the distance, so we were hopeful the rain would stay away. Nope. Momma N had other plans. It was a light sprinkle, so I did my best to remain calm. I don't mind a few sprinkles, but do not like a heavy downpour...especially if I do not have a hat to use as a shield to keep the rain out of my eyes or my hair from getting thoroughly soaked. We continued around the course, and the rain continued to fall....but it was progressively coming down stronger and the lightning was more frequent and appeared to be getting closer. We stopped at the campsite to grab some fuel after the fifth lap. Teri was a little nervous about the lightning, and I was really getting frustrated with the rain. Not only were my shoes completely soaked through, but the sloping trail around the lake was now starting to get numerous puddles. Most of us had either headlamps or knuckle lights, but the puddles were difficult to see in the dark. As the rain continued, the puddles were getting bigger and shifting across the path. 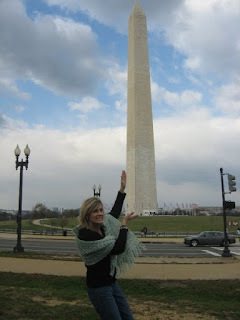 Teri and I stayed together, and did our best to ignore the weather. A few laps later, as we were coming around the final curve by our campsite, we noticed Michelle and Karen. They had gotten a little ways ahead of us, but were walking back from the food stand. Karen didn't look too good. She wanted to sit down for a few minutes, but insisted the rest of us should go on without her. Knowing we'd be around the course in less than 10 minutes, we headed back out. By now, we were starting our ninth lap, and the rain was still falling like crazy. It had been raining for close to an hour, and did not show any sign of letting up. My stomach was feeling a little weird. I wanted make a porta-pot stop, and told Teri to go on. I went back to check on Karen after my pit stop. She was sitting in a lawn chair, and I tried to encourage her to bum a spot under a nearby tent to stay out of the rain. She was huddled under a towel, and didn't want to impose on a stranger's tent. Reluctantly, I headed back out. The rain was such a downer. 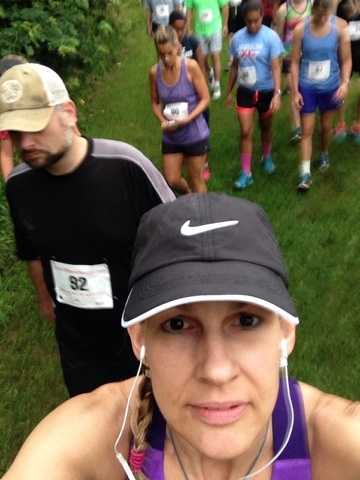 As I crossed the timing mat, starting my 10th lap, I put in my ear buds and turned on my music. Except it wasn't playing. I had charged it before packing it for the trip, but it was not responding! My fingers were sweaty and wet from the rain, so it was difficult to pull the cord out ...sometimes pulling out the cord and re-inserting it does the trick, but not this time. A few more attempts, and I was able to hear music, but it was muted. The volume button wasn't working either. UGH! Frustrated, I yanked the buds back out and twisted them back around my shoulder strap. So far, despite the depressing weather (and failed attempt with my music), the race was going well. Almost 10 laps done, I was approximately a third of the way towards my goal of 31 total miles. I was running just over a 10-minute pace, and feeling good. I had taped my left foot, and the plantar fasciitis was MIA. The usual hamstring tightness was not present, and my typical piriformis aches and pains were not happening either. As I was approaching the hill (approximately 2/3 of the way around on the route), I spotted Penny and Maggie walking. I caught up to them and asked if they were doing alright. It turns out, they decided to walk the hill (on most of their laps) as a strategy to conserve energy. Hmmmm....Don't mind if I do! We made it around to our campsite, and checked on Karen. She still wasn't feeling well, and said she'd gotten sick earlier. My stomach was still feeling a little wonky, so I decided to pass on the fruit snacks (my fuel of choice), and grabbed some pretzels at the food station instead. And, another porta-pot stop was in order. Another lap later, and my stomach was still feeling wonky. The rain was still falling. My music wasn't working. And all of my gal pals were scattered. This (momentarily) kind of sucked. As I made my way back around towards the campsite, I saw Karen still sitting all hunched over. I yelled at her and gave her the thumbs up. She waved back. I made another porta-pot stop (seriously, this was getting old!). I stopped by the food table and grabbed some water and pretzels and felt someone tap my shoulder....it was Karen! She thanked me, gave me the thumbs-up, and took off towards the timing mat to head back out on the course. And that was just the little jolt I needed to get my head back in the game. 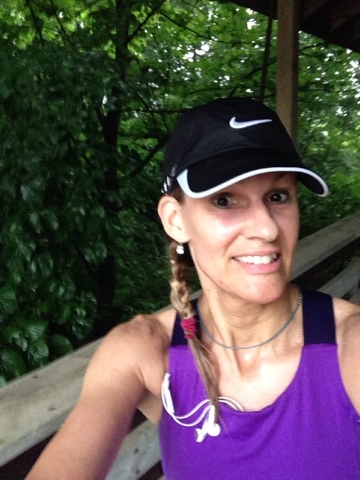 As much as I was hating the rain (and wanting to seek shelter in a dry spot), I had a race to run. I was already wet (actually, I was thoroughly soaked), I might as well keep moving. About halfway around, I spotted Michelle walking. I pulled over and joined her. She, too, was worried about Karen, and was wondering if I'd seen her. I reassured her that Karen was back in the race! Michelle and I broke into an easy pace and chatted for awhile (a couple laps, I think). She was just coming off her first Olympic-distance triathlon (the previous weekend), and wasn't sure how much she had in her...but she was going strong! I don't remember exactly when the rain eventually stopped, I think it was around 3:00AM. I was near the 15-mile mark and felt a second wind of energy. I had needed to pull over and stop at the porta-pots several times (so many times that I honestly lost count). My stomach was just feeling so icky! Thankfully, the laps were going fairly fast, and I was progressively feeling better. Still no hamstring distress or PF flaring up, so things were going pretty good. As I was rounding the curve just beyond the hill on my 18th lap, I was reunited with most of the gang! Penny, Maggie, and Michelle were all walking together. I caught up with them, and saw Karen right behind me! We all walked for awhile, together. 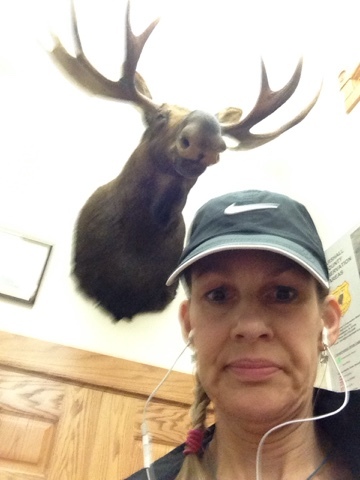 I asked Penny how her pacing was, and if she was still on track for her 34 miles.....and she laughed, and said the "wheels came off of that train awhile ago." She had trained hard for this event, probably the hardest of all of us, but the weather was something that had taken her (and, actually, all of us) by surprise. She'd trained in the heat all spring and summer, but this was much hotter and certainly more humid than what any of us were prepared for, especially in the wee hours of the morning. We made our way to the food table. Karen and I hung back for a minute, and the others continued on. A unique "food" item I had never seen in a race before was flat soda. It was warm, and still had a little bit of carbonation, but tasted great. I also grabbed some pretzels before we headed back onto the course. After a lap, Karen was eager to up her pace a bit, in hopes of making up for some of the time when she'd been resting earlier. I told her to go for it, but I was going to do some run/walk intervals because my hip flexers were really starting to hurt. I found Maggie on the course, so her and I did a lap together. 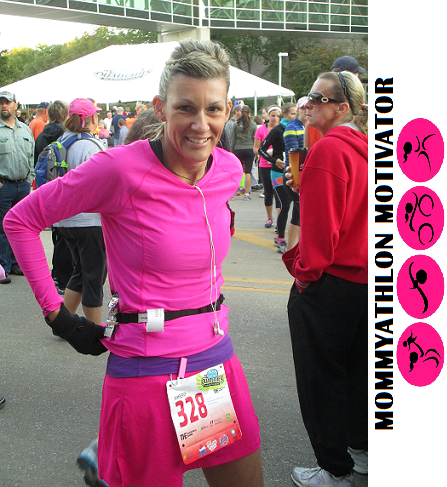 She has been doing a marathon every month in 2015, so she was hoping to finish that distance within the 6-hour time frame of our event. 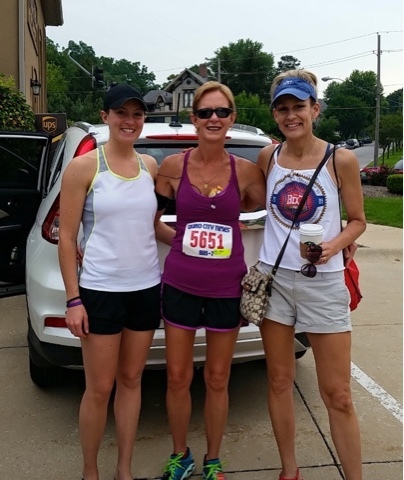 Before long, we came upon Penny, Karen and Michelle as we were starting our 22nd lap. I had noticed the sky was starting to look less "dark" on the last lap, but now it was starting to take on a beautiful, pink glow. It was almost 5:00AM (had we really been at it for almost five continuous hours?). Penny was worried about finishing 26.2 miles before our 6-hour time limit ended....so her and Maggie took off, determined to run the remainder of the marathon distance. My hips were really hurting! I had not had hip pain since my early days of doing half marathons, and I had forgotten how debilitating it felt. Karen said she could tell my gait was off, and every time I got a glimpse of my shadow (from the few remaining street lights), I wanted to wince. It hurt to run, and it hurt to walk. Sometimes, I'd feel a surge of pain in my calves (from the walk breaks), and other times my feet were shuffling too much that I was worried I was going to trip myself. I had really wanted to do 31 miles (approximately 32 laps), but it was very obvious that goal was not happening. I did want to get beyond the marathon distance, though. I wanted to be able to officially call myself an ultra-marathoner.....and if I could finish 27 total laps, I would have met that goal. Six more laps, in a little more than an hour. Let's do this! At this point, I knew I could speed walk almost as fast as I could run. If I ran as much as possible, then did a few speed-walk intervals, I would probably be alright. Michelle and Karen weren't very far ahead of me, if I kept them in my sight and was able to catch up with them intermittently, I'd be able to stay on a consistent pace. 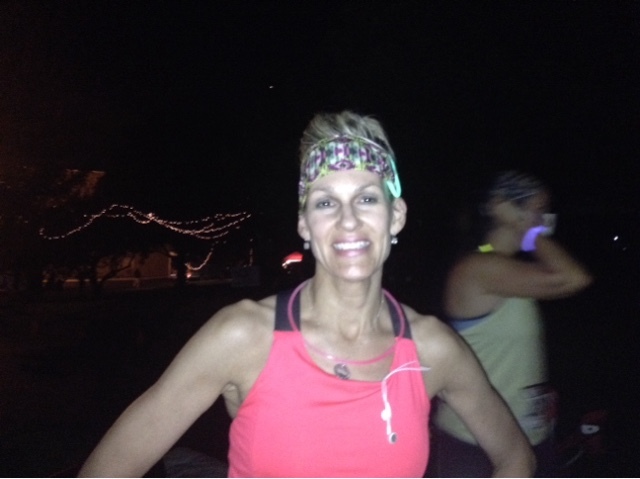 Karen had also reassured me that even if I didn't finish all my laps right at 6:00AM, the race officials would still let me stay on the course (the 12-hour and 24-hour racers would still be on the course as well). My "extra time" wouldn't count in my placing, but the distance still would count for mileage finished. So, onward. I made it around the next lap alright. I managed to catch up with Penny and Maggie briefly on the hill, but I continued to walk a little farther after they resumed running. Thankfully, my stomach was finally feeling relief, so I didn't have to worry about any more porta-pot stops. I grabbed water, Gatorade, or soda each time through the food station after each lap, though. For the most part, I was on my own for the final 3-4 miles. Although I could see everyone, I just couldn't bring myself to "speed up." I was able to keep my pace pretty steady (despite the strain in my hips), but I knew if I tried to overdo it (even with only a few miles remaining), I might not be able to finish. I had not seen Teri or Barb in a long while. I saw Barb briefly at one of my food stops, but that was it (other than running the first two laps alongside her). I think I remember seeing Teri from a distance, but she had been out of my sight for most of the last couple hours as well. I finally made it across the timing mat at 6:06AM. I finished 27 laps, for a grand total mileage of 26.271....just squeaking into the ULTRA distance. My stats showed that I finished 5th (out of the 13 women) in the Masters Division, and I was 22nd out of the total 50 racers (males and females combined) in the 6-hour event. 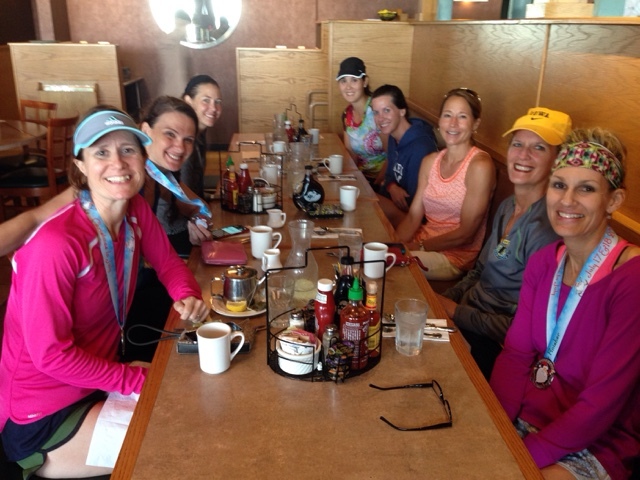 None of the gals in our group were able to get to that coveted 31-mile distance (but Teri and Barb finished 1st and 2nd in the Masters!). Actually, only about half of the 50 runners made it past the marathon distance, and only eight of them were able to surpass 30 miles. We were so proud of Barb and Teri! But we all finished! We made it through the entire night! 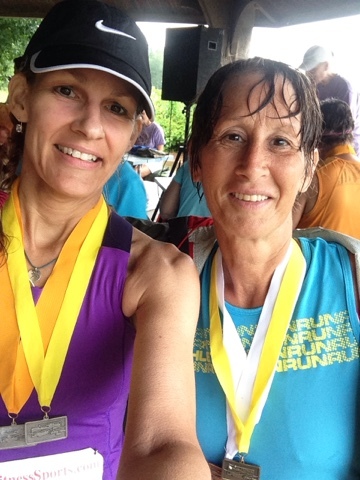 We all persevered through the heat, humidity, lightning, and rain. And let's not forget that menacing hill that we had to conquer on each and every lap on our way to the finish line. After several minutes of slowly walking around (in a daze), and a much-needed change of clothes, we headed out to have a real breakfast. My thoughts on this event? It was fantastic! Even though this race was chocked full of challenges, this event was top-notch. 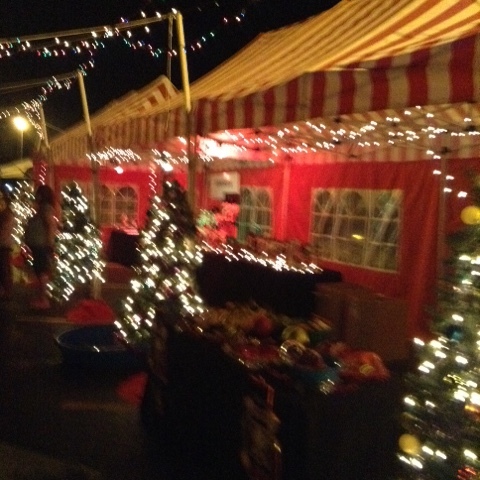 The organizers did a great job with communication, decorations, food, music, and the numerous volunteers along the course and through the night made for a fun time. And the swag! All participants received a short-sleeved tech (royal blue) event shirt and grey stocking hat, and the endurance racers (6-hour, 12-hour, 24-hour) also received a long-sleeved (navy) tech shirt. 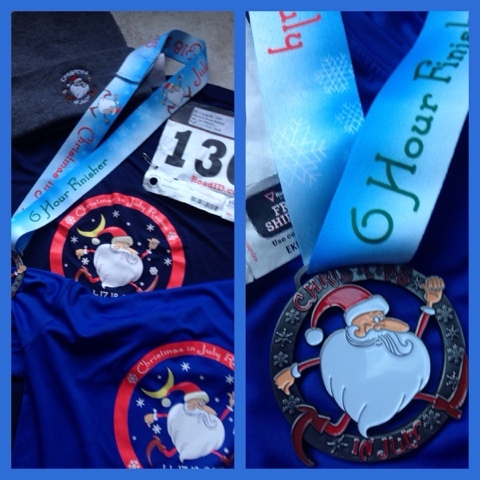 And the finisher medals were adorable! Bottom line, this was the toughest event I have ever done. The midnight start time was a new challenge to face, as were the six hours of (almost) constant motion. The weather was the biggest obstacle for all of us. I don't mind the heat or humidity, but it does call for a shift in perspective and requires a more conservative pace to sustain yourself. For me, the rain was my biggest obstacle. A few light sprinkles are manageable, but a couple hours of non-stop rain makes for a very frustrating battle. Also, as mentioned in previous blog posts, my training was less than ideal in preparing for this. My spring calendar was full of several other obligations (family and social events) that took precedence. I'm thankful I have a strong endurance base to carry me, otherwise the six hours of running would have ended several hours early. Although I fell short of my 50K goal, I am more than satisfied with my finish. Technically, with all the trips back and forth to/from the porta-pots, I probably came close to doing 28 total miles. Seriously! That is not an exaggeration. More important than how any of us finished, though, was the bond we had with each other. Although I had a few miles on my own, most of the six hours on the course were spent with these lovely ladies. There was constant laughter, hugs, chatter and encouragement all night long. It's been a few days since this grand experience, and (dare I say it? ), I feel nearly recovered. Of course, I realize I am not really as recovered as I "feel" at the moment, I guess the endorphins are still circulating through my system. All of us from our UBAGE group have already tentatively made plans to return next year...and maybe give the 12-hour event a whirl! We had such a great time facing all of the challenges, together, on the race course, why not do it all over again? 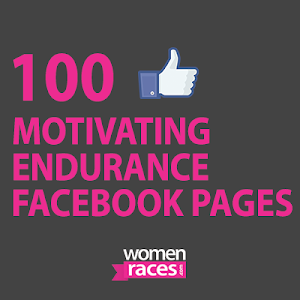 Have you ever taken on an ultra marathon? 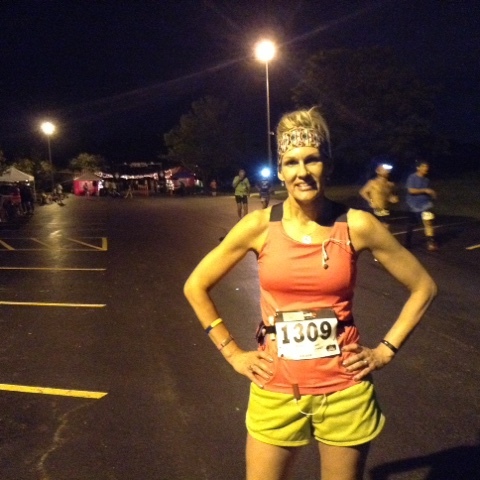 Have you run in a timed endurance event (6-hour, 12-hour, or 24-hour)? Well, lesson learned (though it really comes as no surprise). Ever since my marathon three weeks ago, I have had several short runs (nothing more than 5 miles). Most of these short runs have been challenging and not much fun. Achy feet (PF keeps coming and going, but is pretty manageable), strained hamstrings, and slower-than-ideal pace. Yadda Yadda Yadda. I did have a 2-hour training run (two weeks ago) and that felt great, though. Recovering from a marathon is very different for every runner (just like training for a marathon is). Some (though not many) can bounce back quickly, others (probably most) will need several weeks for their bodies to properly recover from the stress and strain of running 26.2 miles. I also think a lot of runners are never quite as recovered as they think they are, myself included. Amidst all of this recent frustration, I decided to scale back my mileage this past week. I ran on Monday (following a very busy weekend), and it was a challenge to get my body to go one mile. One mile! What was up with that??? Instead, I did some cycling. And yoga. A little bit of strength work. And a whole lot of nothing else. 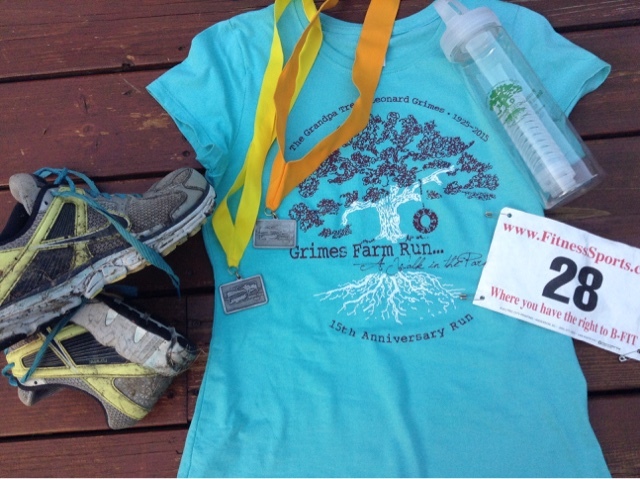 On Saturday, I ran The Grimes Farm Run trail race (approximately five miles), and it felt almost effort-less. My finish time was 42:57, a substantial "event" PR (by just over eight minutes!). Granted, the course had to be re-routed due to rain (and some flooding), so it wasn't the exact same course as in the two previous years (you can read about 2013 experience HERE) that I have run it (and I don't think this year's course was quite a full five miles), but I know I ran it strong. I felt some slight hamstring stiffness, but only in the very beginning. And, due to the re-routing, the majority of the route was on asphalt trails (and not as much on the grass, brush, or muddy trails through the timber as usual). I even inadvertently ran a little ways (100+ yards?) beyond the turn-around point (and the guy at the water stand just let me keep going), so my finish time (maybe an additional minute? 45 seconds?) reflects a little more distance than any of the other runners. Somehow, even with the extra distance, I managed an overall third-place finish amongst the females, and a second-place age group award. I realize, due to the less-than-ideal weather (non-stop rain, with a "chance of thunderstorms" in the forecast), my competition was limited. Had the weather been drier, I'm certain there would have been a lot more runners at the start line (and, most likely, a few more gals in my age division). In the 10 years that I have been running (and racing), one thing I have learned is whether or not a runner "places" in their age group (or is one of the top over-all finishers), it is all relative to who else shows up. It doesn't matter so much if you earn a medal for being one of the fastest at the event, but whether you're able to give it your all and have a successful experience. I'm not trying to minimize my experience or performance at this race; instead, I am hoping to be realistic. Also, my ego is in check and I do not plan to assume any future races (trail or otherwise) will guarantee double hardware (but a gal can dream, right?). Having a "successful" experience is a subjective interpretation of what actually happens on the race course. 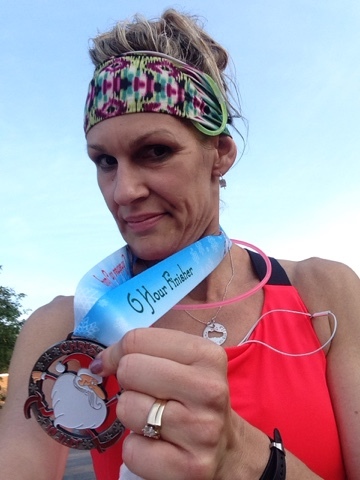 This trail race was very successful for me...not because of the two medals I brought home, but because I was able to let go and run free with minimal struggle (trust me, that has not happened in a long time). I didn't have my GPS watch with me, so my actual distance is unknown. If it was indeed five miles, that would calculate to just over an 8:30ish pace...which is realistic for me to do on exclusive cement or asphalt, but certainly not on wet grass, sticky mud, or slippery hills in the rain. Regardless, I know I ran this race well. It felt like my pace stayed consistent from start to finish, even over the hills and through the countless puddles. This was my third consecutive year running this race, and I definitely want to go run it again and again. 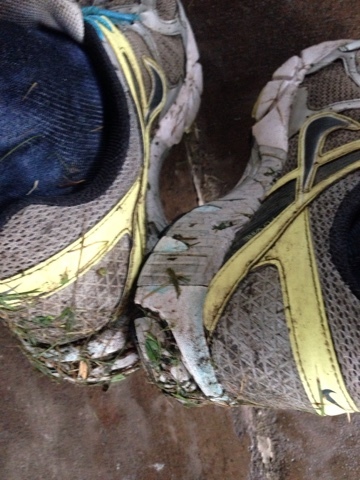 I really enjoy the challenge of trail running (even in the rain). Yes, we had rain! Plenty of rain. It didn't start raining until around 5:45AM, but continued throughout the entire morning (although it did let up a few times, briefly). I don't mind a few sprinkles on a hot summer day, though, and the rain wasn't a problem to run in...though it did create some slippery spots on the hills and give us several puddles to dodge. This picture doesn't do justice to how wet & dirty my shoes were! This event is very well organized, and every year the swag is decent! There's always a nice shirt (with great graphics), and this year we also received infusion water bottles with the Grimes Farm Run image on the front. In addition to the 5-mile trail (technically, it's an 8K), there's also a 5K and a 1-mile option to run or walk. They also are very generous with awards, recognizing both walkers and runners in all of the age divisions for each of the three events. For more information on the Grimes Farm Conservatory, you can check out the website HERE. 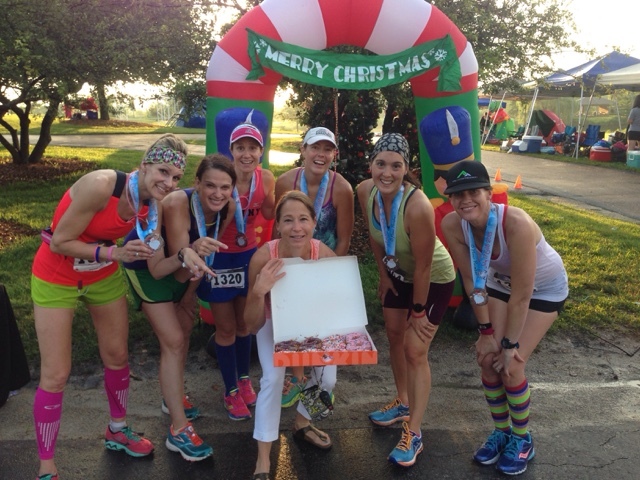 Do you have a favorite race you do every year? How do you feel about trail running? Ever run a race that left you feeling totally accomplished, even if you didn't bring home any hardware for your efforts? Or, conversely, ever receive an award for a race that you were less-than-satisfied with your performance?